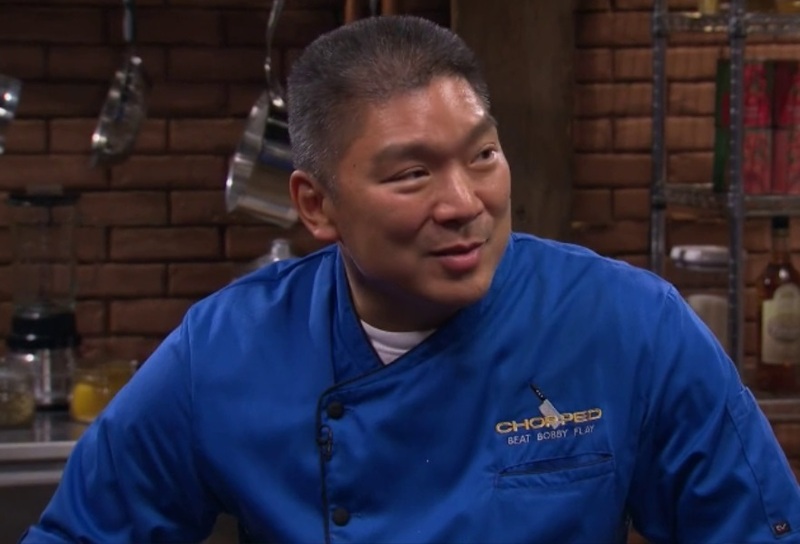 Chef Seis Kamimura breezed through his first several rounds on Chopped: Beat Bobby Flay, but as the judges have constantly reminded us, beating a dozen chefs is nothing like going up against the great Bobby Flay. He’s not immune to mistakes, however, and he made a few significant ones tonight, to the point that many fans belief Kamimura should have won. This was by far the closest showdown on Chopped: Beat Bobby Flay. Both chefs were tasked with the incredibly difficult challenge of creating bibimbap, an iconic rice-based Korean dish. Bibimbap is Kamimura’s signature dish, although Flay also has some experience with it. But this wasn’t any bibimbap creation; in true Chopped fashion, the contestants had to use a few very unusual ingredients. These included rib-eye steaks, black garlic, fish maw (dried fish bladders) and a piña colada mix. Both chefs rose to the challenge, although they suffered multiple setbacks. The biggest of these was pure clumsiness; Kamimura knocked over a pot and essentially had to start over, with less than half an hour to go. He didn’t have a chance to clean up his mess, which presented a hazard to both chefs. Flay slipped and almost fell, but managed to right himself, only sacrificing a few eggs. The results of this challenge were incredibly disappointing. It all came down to rice versus meat. Kamimura did an amazing job with the steak, but his rice just was not up to par. Conversely, Flay’s strengths were his rice and mushrooms, both of which were complimented heavily by the judges. In the end, the problematic meat from Flay’s dish was deemed less of an issue than Kamimura’s rice. We don’t agree with the judges’ choice for a few reasons. First, they didn’t seem to take presentation into account. Kamimura worked hard to create an edible work of art, whereas Flay’s dish looked thrown together. The other big issue is a little more open to interpretation: Is rice or meat more important in a dish such as bibimbap? Yes, rice is one of the defining elements of this dish, but flavorful meat should trump mastered rice, especially when the presentation of said rice is so problematic. The other reason we wanted Kamimura to win is pure necessity. He has a family to raise, and frankly, he needs the money more than Flay needs another victory on his résumé. Yes, the competition is ultimately decided on merit, but with the two so close, it would have been nice to see Kamimura go home with a victory. Do you think Bobby Flay deserved to win tonight’s bibimbap challenge? Comment and share your opinion below.